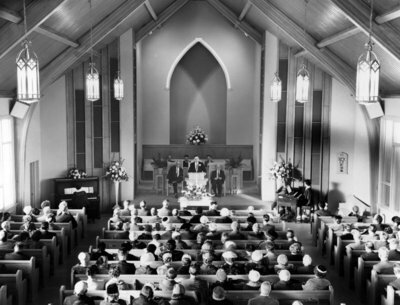 A black and white photograph of the interior of Faith Baptist church. The Faith Baptist Church was built in 1959 and opened on November 29 of that same year. It was replaced by a larger church on Taunton Road East at the end of 1979. In 1980 it was converted into a dinner theatre, and later reverted back to being a church. This picture was taken on the date of the official opening. Interior of Faith Baptist Church, November 29, 1959, Bill Stannett. Whitby Archives 09-008-006.